Time was when the Ambassador, made by the decidedly nationalist sounding Hindustan Motors, was the official car of those suffering from the “Lal Bathi Syndrome” id est the political elite. 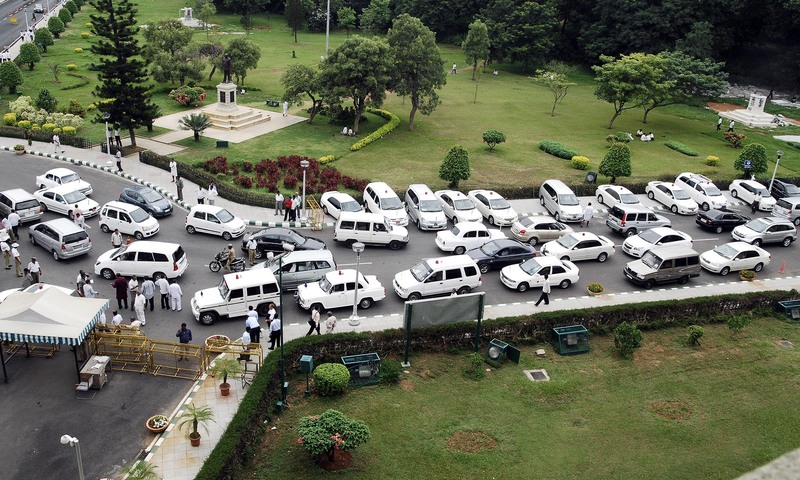 At the Vidhana Soudha in Bangalore on Thursday, the red lights on top of vehicles provide a bird’s eye-view of how reforms broke the back of a Calcutta monopoly. Except that the preferred colour remains white, although the affairs inside have become markedly black. This entry was posted in Kannada & Karnataka, Life Etcetera, Mysore-Bangalore and tagged Ambassador, Churumuri, Hindustan motors, Karnataka Photo News, KPN, Liberalisation, Reforms, Sans Serif, Vidhana Soudha. Bookmark the permalink. ← CHURUMURI POLL: Murali, Warne or Kumble? White shrouds for black hearts! and so many gas guzzlers ! ?